One of our three native snakes, the adder is the UK’s only venomous snake. However, they are not aggressive and no one has died from an adder bite in the UK for at least 20 years. Adders are the most commonly seen snakes in the UK, mostly because they are less likely to move into cover if disturbed. They hibernate through the winter and emerge in early spring. Males shed their winter skin and are ready for mating by the middle of April. Females incubate their eggs internally, giving birth to up to 20 live young in August or September. Like other reptiles, adders are ectothermic, meaning that they cannot generate their own body heat. As a result, they need to raise their body temperature to 25℃ to 30℃ before they can become fully active and will bask in patches of sunlight to raise their temperature. Pregnant females bask in the sun to aid the development of their young inside their bodies. 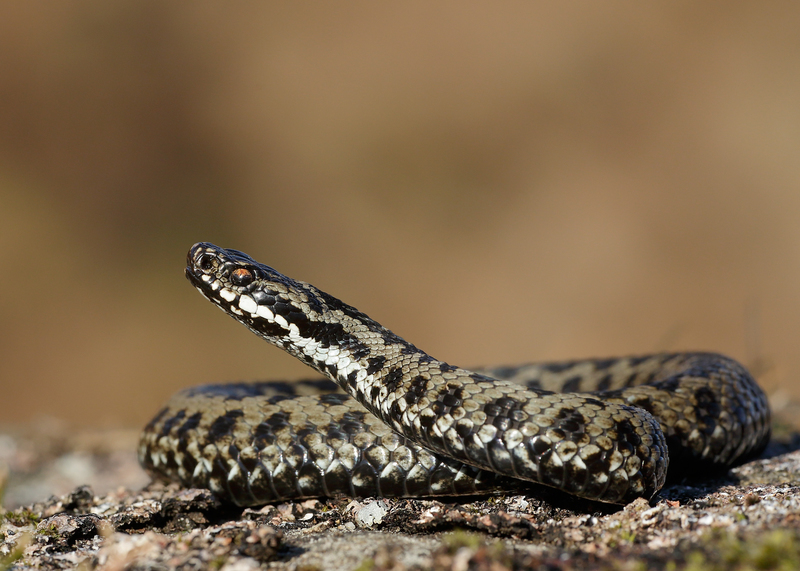 In the UK, it is often May before daytime temperatures are high enough for adders to being hunting for food. When hunting, adders strike swiftly, delivering a venom-injecting bite to their prey. Then they wait for the prey to die before swallowing it whole. They are able to extend their jaws to swallow prey much bigger than their heads, whilst their ribs are not joined and can also open outwards to accommodate much larger prey. Their digestive juices are very powerful, so only the teeth and hair of a rodent pass through the snake.